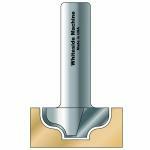 Plunge Ogee router bits are optimal for detailing panel doors and shallow bowling. These carbide tipped Whiteside bits are perfect for crafting a raised panel effect and adding a bold accent to large work pieces. Choose from the available shanks and diameters below to add new Whiteside Plunge Ogee Router Bits to your collection of woodworking tools today. 3/32" 1/4" 1/2" 1-3/4" 1/4" 1/8"
3/16" 1/2" 7/8" 2" 1/4" 3/16"
3/16" 1/2" 7/8" 2" 1/2" 3/16"
3/16" 1/2" 1-18" 2-1/4" 1/2" 3/8"